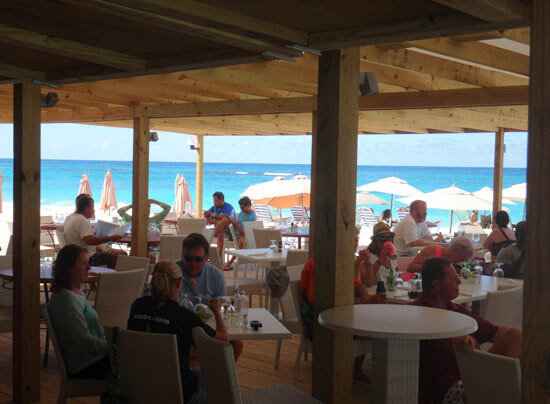 Madeariman Anguilla Restaurant... A Top Spot for a Shoal Bay Anguilla Beach Day! A Top Spot for a Shoal Bay Anguilla Beach Day! 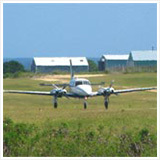 One of the can't-miss Anguilla activities on an Anguilla vacation? 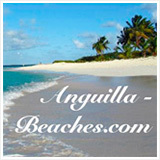 A Shoal Bay Anguilla beach day! 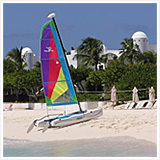 This two mile stretch of sand features many Anguilla hotels, Anguilla villas, and beach bars and restaurants. 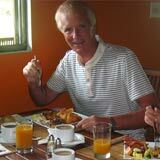 My good friend Kristin has recently been raving about Madeariman Anguilla restaurant on Shoal Bay. It is one of the best spots for a Shoal Bay beach day! 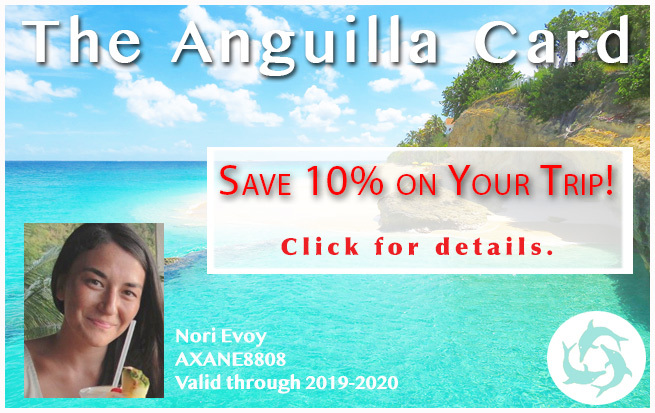 Those of you familiar with Anguilla's busiest and world-renowned Shoal Bay Beach will know about all of the restaurant options there. As many times as I have been to Shoal Bay Anguilla beach over the years, I had not tried Madeariman until just recently. 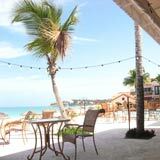 To be honest, I have no good reason for not trying this Shoal Bay Anguilla Restaurant! Beachy Blend of Sand, Surf, Shade, and Delicious Food! I've been to Elodia's, Gwen's, Uncle Ernie's and Tropical Sunsets, my go-to spot. 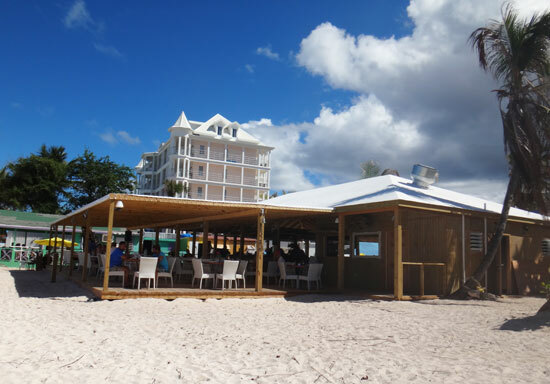 Once I'm there, I don't usually venture up the beach in search of another beach bar stop (though I hear making the "Shoal Bay Beach Bar Rum Punch" crawl is a fun walk (or stumble!). I have always known about Madeariman and its laid back atmosphere... I had a friend make an impromptu stop there in once (as I sat in the car), to get a bottle of wine and a couple of glasses "to go." I remember thinking then that they were so nice to allow two of their glasses to leave the premises, trusting that they would be returned! That has been my only encounter with Madeariman, however. Now, of course, I know better! How I regret all of those times I could have been eating there. 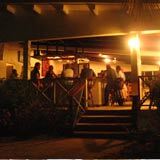 It ranks as one of my favorite Shoal Bay Anguilla Restaurants. My first time at Madeariman was a Saturday prior to a Tropical Storm passing by during the off-season in mid-September. 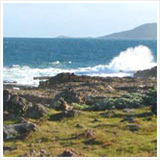 I met some friends there to thrash around in the extra large waves that were crashing down at Shoal Bay. This may sound quite abnormal, but riding those waves is so exciting! Note: When Tropical Storms are close, the waves tend to get bigger around Anguilla, especially at mostly unprotected Shoal Bay. I wasn't thinking of food (for once!) 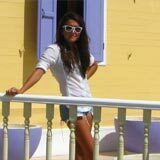 when I made my way to Shoal Bay that day. 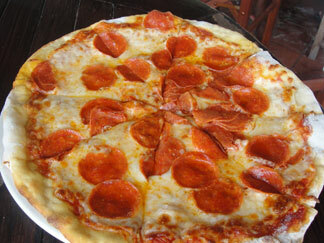 But, after I got there and I saw the pepperoni pizza my friend had ordered for her kids, I had to have one. It had a nice balance of cheese and sauce, a nice thinnish crispy crust, and pepperoni's strategically placed to ensure a bite that gave you a bit of everything. Their pepperoni pizza lists olives as an ingredient as well. They are known to throw a few on (which I like) but you can easily ask them to leave them off if you prefer. I loved it. It held its heat, it was just greasy enough, not too greasy. I ate a couple of pieces and took the rest home to make 2 more meals out it. 'Nothing like left over pizza! Yum! I made note of the menu while I was there even though I was an easy sell on the pizza that day. 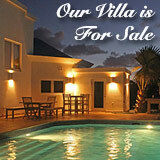 They have a wide variety of options at this Shoal Bay Anguilla restaurant... Wow! Burgers, pastas, a variety of pizzas, seafood, and salads, even snack type appetizers like chicken wings and calamari all grace their menu. I wondered then if they could pull off that many different items all being as good as the pizza?? My friend was telling me that she loved their tuna sashimi, so that was my first clue that maybe this is one of those places where everything is good, as opposed to just one or two specialties. 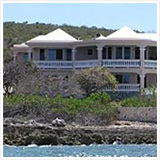 Second Visit To This Shoal Bay Anguilla Restaurant! Madeariman was on the agenda, again, and was I ever excited! 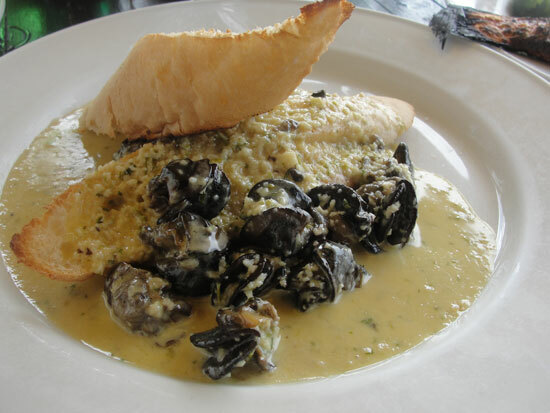 I met a larger group of friends there and our orders were a gamut of Escargot (yes, they even have that), Whole Fish, Chicken Fingers, Pepperoni Pizza, Cheese Pizza, Calamari, Caesar Salad, and Pasta Carbonara. 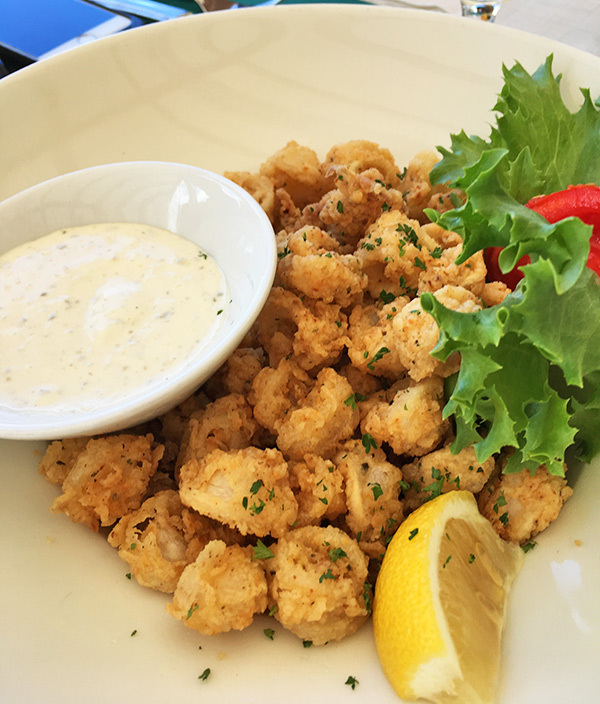 It's easy to "destroy" calamari and yet it was flavorful and not tough. Crispy goodness with a yummy tartar sauce dip. 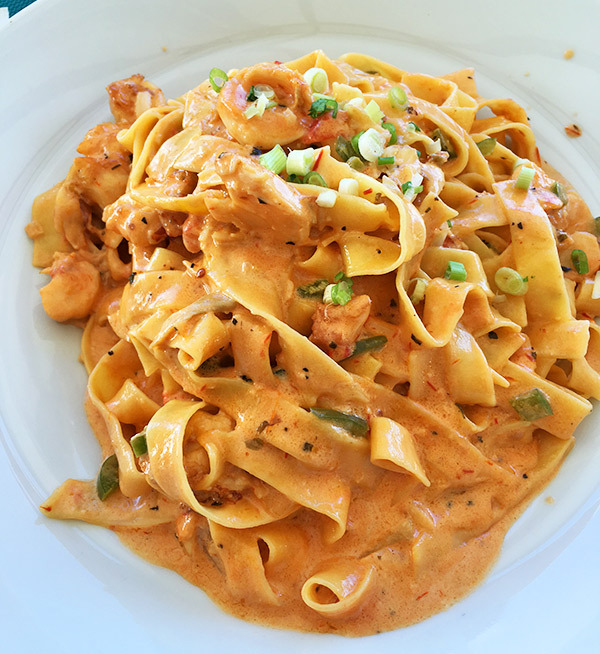 As a main course and from the "Pasta" section from the menu, I went with the lobster tagliatelle. It was enough to feed everyone in the restaurant... Which is never a bad thing! The flavor was a tasty, rich cream sauce and HUGE chunks of lobster. I would get it again for certain, if I am in the mood for a big plate of rich pasta. I'm usually skeptical of places that offer so much of a wide variety. It reminds me of a Greek Diner where I used to live that had everything from spaghetti to open-faced roast beef and mashed potatoes, to shrimp scampi and steak. I'm so happy to report that Madeariman (so far) impresses me with their ability! The prices aren't bad either. I paid US$18 for my pasta and made three meals out of it. Another important point to make about Madeariman is the atmosphere. They had music playing that gave the place some energy even though it's a laid back, beach restaurant... Regular clothes and bathing suits, anything goes. Their music level allowed for you to enjoy the music but still have a conversation without yelling or straining to hear. A little later in the day, they turned up at the volume slightly, closer to closing time and started playing some of our favorite local tunes from the Road March winner for 2010 and 2011 Anguilla Carnival. 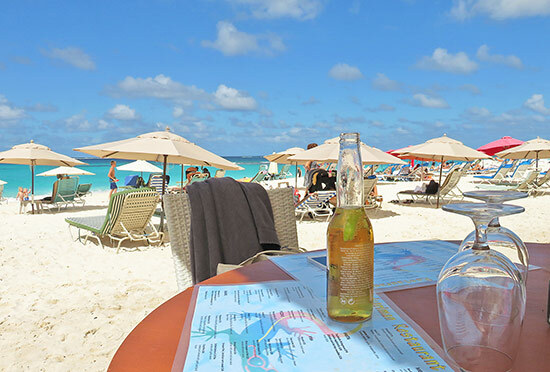 Tip: It's ideal to have a table at the edge of the sand and be able to go into the sea for a quick dip and then come back to for another quick bite or to order a cold drink. My friends and I were discussing how the timing of getting our food wasn't too slow either. 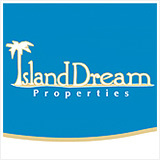 As you know, the Caribbean isn't known for promptness, hence the term "island time". Madeariman allows you to feel relaxed, not rushed, but they also don't make you wait two hours for your food! Our orders all came out very close to each other as well. Their timing has been right on in my experience. 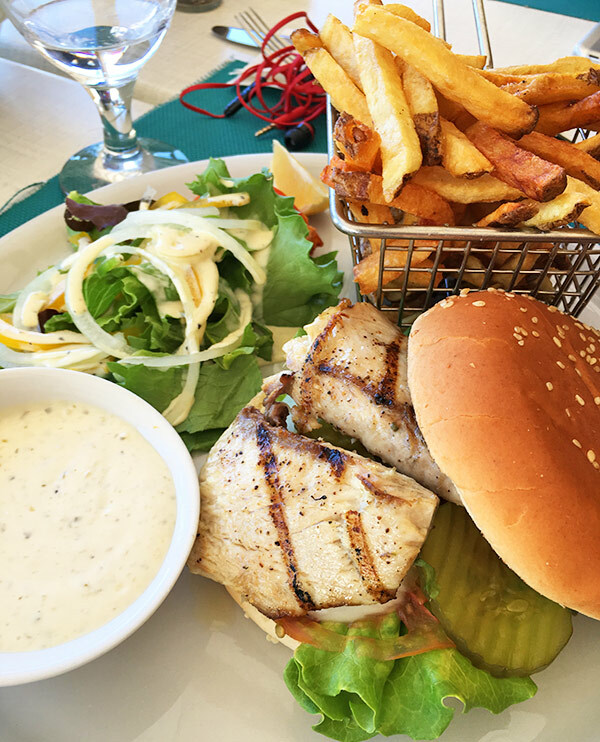 Both afternoons at Madeariman Shoal Bay Anguilla restaurant were blissfully perfect... From the beach, to the food, to the company! 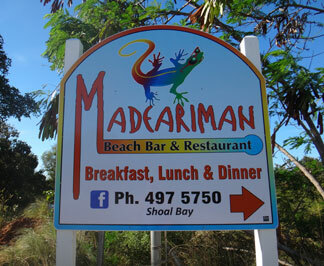 If you are looking for an easy going Shoal Bay beach day and need a restaurant recommendation, Madeariman is it. They have a menu item for anyone and chances are it's a well done dish in an unpretentious place, on one of the top-ranked beaches in the world. Not a bad way to spend an afternoon in Anguilla! In fact, fantastic! Update 2017: After suffering from a fire in 2016, I am happy to report good news from Shoal Bay East... Madeariman has RE-BUILT and RE-OPENED! More on the NEW Madeariman here. 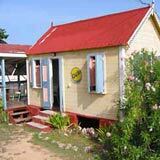 Directions: Located next door to Uncle Ernie's on the western side of Shoal Bay East. 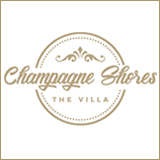 Good spot for a Shoal Bay beach afternoon, with tasty French cuisine and beachside location. Hours: Lunch is served daily from 11am-4pm, and dinner is served daily from 6-9pm.